Join us at the Collingwood Public Library on Saturday, April 18th from 1:00 pm to 3:00 pm for a celebration of Earth Day with crafts, science, music and much more! Children aged 7 and up will be able to enjoy a variety of experiences at several interactive stations organized by the Georgian Triangle Earth Days Celebrations, NEOrganics and Elephant Thoughts. Children can make a flowerpot from newspaper and plant marigold seeds, look at bugs and pond water through a powerful microscope, learn about turtles, snakes, chickens and other creatures they share the earth with and find out how bees and beekeepers work together to make honey! 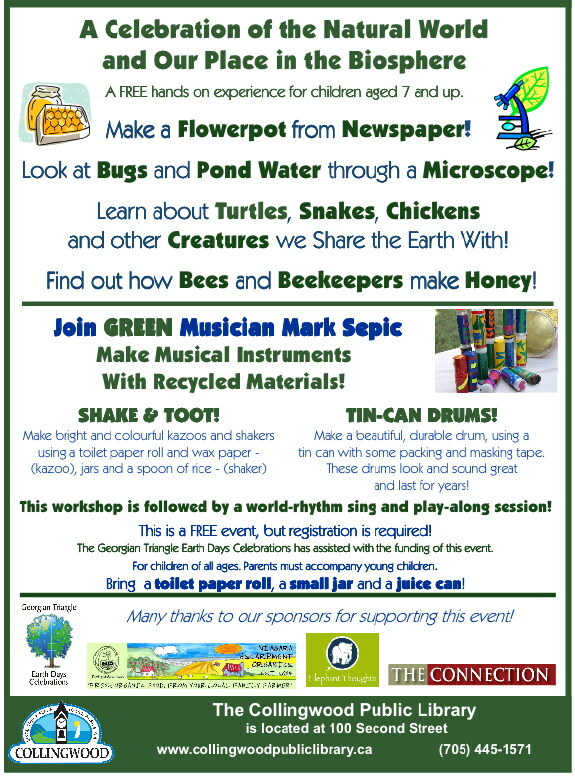 ‘Green Musician’ Mark Sepic will teach children how to make musical instruments from garbage! Mark Sepic is an internationally recognized guitarist/composer, whose virtuoso finger-style guitar; appealing vocal style, impeccable taste, child-like sense of play and some electronic loop-wizardry make his concerts an irresistible joy-ride into the magic of music. Kazoos, shakers and drums will be created using paper toilet rolls, jars and cans. The workshop is followed by a world rhythm sing and play along session. The events are all FREE. Registration is required for the Musical Instrument making session. The Georgian Triangle Earth Days Celebrations has assisted with the funding of this event.